Kimberly Rabanal (left) was five months pregnant when she decided to return to school. Just three months later, her father was diagnosed with brain cancer. But she persisted and, on Friday, she walked onto the stage at GCU Arena to receive her master’s degree in nursing. Normally, Kimberly Rabanal wouldn’t just accept a B. But on one particular occasion, she thought she would make an exception. “I got all A’s, but the one B I took, I was literally in the hospital to have my third child. I told the professor, ‘I’ll take whatever grade I have now,’” said Rabanal, who achieved something she didn’t think she would when she started to look back at all the roadblocks life threw her way. She was among Grand Canyon University’s College of Nursing and Health Care Professions master’s degree candidates at Friday afternoon’s commencement ceremony – the fifth in a series of eight that span three days. GCU’s traditional ground students graduated in a record three ceremonies on Thursday with nontraditional, online students walking the stage in five ceremonies on Friday and Saturday. A few weeks later, when she was in the hospital having her baby, her father was undergoing his first chemotherapy treatment. Even then, Rabanal didn’t stop that journey – one that first entered her mind when an opportunity came up at work to advance her career. One of the preferred requirements was a master’s degree. It was in March 2016 that Rabanal, a nurse in Stockton, Calif., decided to return to school and earn her master’s in nursing — Stockton’s emphasis was in leadership. She was five months pregnant with her third child at the time, and she was working full-time as an interim nursing director. But somehow, all that life happening around her – a husband, a growing young family and a full-time job — didn’t dissuade her. Neither did her father’s devastating cancer diagnosis. It pushed her to strive harder. 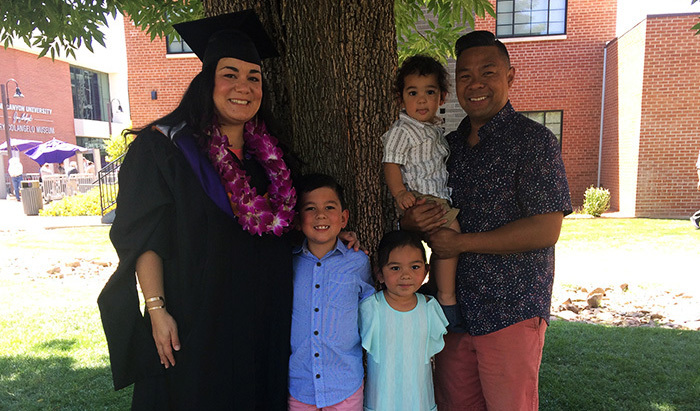 With a third child on the way, she knew what that degree would mean for her family. “Instead of it letting it be a deterrent, it was a motivator,” said Rabanal, who flew in from California with her family to attend commencement. It was the first time she had stepped onto the University campus after a year and a half as a distance learner. Rabanal is the first in her family to go into nursing. She embraced the idea of caring for people. Rabanal has since earned the position of nursing director at St. Joseph’s Medical Center in Stockton after serving as interim director. She oversees three inpatient nursing units and manages about 85 staff members. Jimbo attended commencement with the couple’s three children — 7-year-old Owen, 4-year-old Ella and 2-year-old Evin — in tow. It was important for her to be able to share the experience with her children, she added, and be an example to them. She wanted to show them how important education is and that one day, they, too, will be stepping onto a college campus and receiving their degree. “My oldest son is 7, and I thought it was incredibly important for him to witness this moment,” she said. Thinking back on her academic journey, she said, “Surprisingly, I managed everything,” and she did so with her family’s help and the flexibility GCU offered in her coursework. Even more encouraging, her mother and father made the trip to GCU with her. You can reach GCU senior writer Lana Sweeten-Shults by email at lana.sweeten-shults@gcu.edu or call her at 602-639-7901.